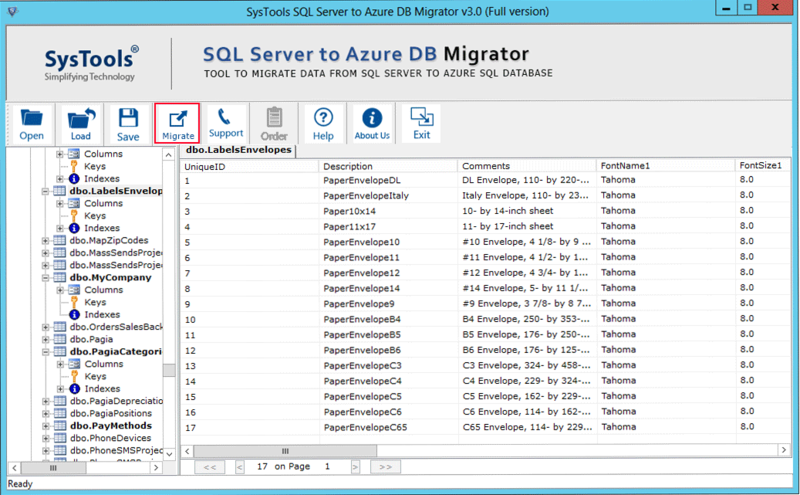 For this objective, an automated tool exists known as SysTools SQL to Azure Database Migrator. This utility can be of great help. This tool is compatible with SQL Server 2017, 2016, 2014, and all other versions beneath them. This application is designed with an advanced algorithm which equips the user to migrate data items with two different options like “With Schema” or “With Schema & Data”. The other technical aspects of the utility are explained in detail in this abstract. The SQL to Azure Database Migrator comes in two different editions, i.e. Demo and Full Licensed version. Both these versions are explained here. It is free of cost application that can be used by simply downloading from the Official website of SysTools. No license required to work on this program. Since it is a free edition, there are some limitations associated with it. Using the trial edition, entire data from MDF and NDF file cannot be transferred. Moreover, migration with Schema and without schema can also be not attained. If a user is satisfied with the operating capabilities of SQL to Azure database migrator, it can be purchased via a secure payment gateway. No restrictions are applied to the user while exporting a SQL database to Azure. Users are equipped to migrate SQL data to Azure SQL database using this converter application. Some of the credentials like the name of the server, username and password, the name of the database, etc., are needed to transfer data from SQL server. The overall database objects from the SQL server can be migrated to Azure like tables, views, rules, indexes, sequences, functions, stored procedures, unique keys, associated primary keys, data types and all other elements. The tool moves damaged SQL database into a healthy database. The database is migrated from local SQL server to Microsoft Azure SQL server. When a user selects files to transfer, the utility quickly scans the desired file and then, migrate it into a healthy state. It is a well-intelligent utility to detect the edition of SQL server before moving it to another database. Oftentimes, it happens that the user already knows the version of SQL server. In that case, the product provides a number of options so that user can select the option manually. Generally, it happens that some records might have been deleted accidentally by a user. And these deleted records have to be migrated to the Azure database. The migration product provides a facility to do that. SQL to Azure database migrator facilitates the user to migrate selective SQL objects. Users are equipped to choose objects from the entire list. The chosen objects are then migrated to SQL Azure database. From the export dialog -box, components can be selected. The product facilitates the user to restore the SQL database to SQL Azure database. If users want to export their data into the new Azure database, it can be created in the Azure server. SQL to Azure migrator gives two options to users to migrate SQL database to Azure database. The data can be moved as “With Schema” or “With Schema and Data”. Both these options can be opted to transfer SQL database to Azure SQL database. Many times, it is needed to move the SQL database to Azure SQL database. It is just because users want to transfer their on-premises SQL Database to Azure SQL Server Database. This can be done using SysTools SQL to Azure database migrator. All the technical details regarding this application are described in the write-up. The software yields very effective and accurate results in a short period of time.